Knowledge Management Solutions, Inc. (KMSI) a leader in Web-Based Training and eLearning Technologies announces KMx Mobile. KMx Mobile provides eLearning, Performance Management and Collaboration Tools for iPhone, Android, Microsoft, Blackberry and other mobile devices. In connection with this announcement, KMSI will be providing a FREE web seminar to introduce the courseware development and delivery options available for iPhone, Microsoft, Blackberry and Android mobile devices using KMx Mobile. Our extensive industry research has concluded that no other learning technology platform can support the development and delivery of eLearning courseware for mobile devices, with full conformance to the SCORM learning management standard. Please join us for a FREE KMxLive Virtual Classroom event titled "Develop & Deliver Training with KMx Mobile" to be presented on July 22, 2010 at 2PM EDT at www.KMxDirect.com. 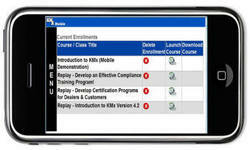 KMx Mobile provides eLearning, Performance Management and Collaboration Tools for iPhone, Android, Microsoft, Blackberry and other mobile devices. In connection with this announcement, KMSI will be providing a FREE web seminar to introduce the courseware development and delivery options available for iPhone, Microsoft, Blackberry and Android mobile devices using KMx Mobile. KMx Mobile provides development and delivery of eLearning courseware, knowledge management and collaboration tools for mobile devices, with full conformance to the Sharable Content Object Reference Model (SCORM) standard. "Our clients can now leverage mobile devices to deliver and administer performance appraisals and peer reviews, provide instant access to company experts via chat rooms and threaded discussion forums, and deliver a robust content repository for just-in-time training and to support workers in the field” said Brandi Lee, Vice President of Customer Service at KMSI. The KMx SCORM Application Programming Interface (API) is the only full implementation of the learning standard that has been designed to support both online and offline use. With KMx Mobile the KMx core platform technology has been extended to provide support for most mobile devices and hand-held devices. "It is really exciting to see health care providers, insurance agents, sales executives and workers from all industries access learning objects and assessments using mobile devices in the field, instead of having to break away from the task to find a workstation to access critical information. KMx mobile courseware can provide a rich media experience with audio, video, animations, exams, surveys, branching and interactivity” said Mike Binnix, CTO of KMSI. KMSI has also included a full mobile collaboration suite with the KMx Mobile release. Collaboration features include mobile chat rooms, threaded discussion boards, surveys, performance evaluations, a searchable knowledge management system, a performance management system and talent management tools. KMSI will be providing a FREE web seminar to introduce the courseware development and delivery options available for iPhone, Microsoft, Blackberry and Android mobile devices using KMx Mobile. Visit http://www.kmsi.us/white_paper13.htm to learn more and register! About KMSI: Knowledge Management Solutions, Inc. is a leading provider of innovative knowledge and learning management solutions for Fortune 2000 companies and government agencies. KMSI provides technologies and services that enable clients to achieve high performance by measuring and meeting the training, qualification and performance needs of management, employees, agents, partners, suppliers and customers.